More than 70 percent percent of Americans support an increase in the national minimum wage of $7.25 per hour. But minimum wage legislation is frozen in Congress. Part of the reason is big political spending by low-paying employers. In the 2014 cycle, Walmart alone spent $14.8 million on political contributions and lobbying. The U.S. Chamber of Commerce spent over $35 million in independent expenditures. Salomon “Sal” Fuentes once had a good paying job as a machinist in Southern California, making $18 an hour. But when the company he worked for started buying goods from China, Salomon was laid off. Over the next several months, Sal repeatedly applied for jobs in order to continue to provide for his family. He went back to school, worked in various short-term jobs, and even tried driving a taxi to make ends meet. Sal’s only choice for a “stable” job was an offer from Walmart to work for $8.45 an hour, less than half of what he’d been making as a machinist. Knowing he had to support his family and thinking it would help him make ends meet until he found a better job, Sal began working at Walmart in 2006. “It was troubling, but it was a job,” he said. Soon, though, the economy crashed and Walmart began cutting hours and staff, while adding extra tasks for employees. There were fewer jobs to apply for, so Sal felt trapped at Walmart. “I felt alone and helpless,” he said. Sal’s turning point came when one of his pregnant coworkers was feeling ill but the manager would not allow her to go home early. Soon, the pregnant employee fell to the ground and someone had to call 911. 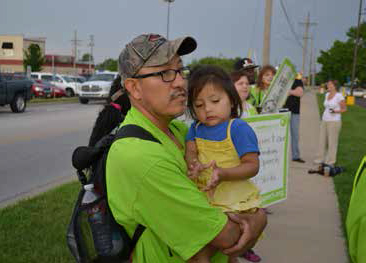 When management didn’t change any of their policies, Sal joined the OUR Walmart campaign to stand up for himself and his coworkers. Sal’s story is not uncommon. Millions of Americans are working in low wage jobs. When they talk about raising the minimum wage or passing paid sick leave, they are not looking for a handout, they are looking for justice. And the American people agree with them. A recent poll by CNN showed nearly 3 out of every 4 Americans favor raising the current $7.25 federal minimum wage. With economic inequality growing in the United States, the battle to raise the minimum wage has come to the forefront of American political debate. The federal minimum wage is now 23 percent lower than its inflation-adjusted value in 1968. A 2013 report by the Economic Policy Institute shows that raising the federal minimum wage to $10.10 by 2016 would increase the pay of 27.8 million Americans and grow the GDP by about $22 billion, resulting in the creation of 85,000 new jobs. Despite both the need and widespread support for a higher minimum wage and other measures that help low-wage workers, a small number of big-money donors have spent millions of dollars to keep wages low. Perhaps there is no better example than Sal’s employer, Walmart. The Walton family, worth $148.8 billion, has more wealth than nearly half (42 percent) of American families combined. Between 2000 and 2012, the Waltons and the Walmart PAC spent more than $17 million on federal elections. During the 2014 cycle alone, Walmart spent nearly $14.8 million on campaign contributions and lobbying. Political donations clearly are not about partisanship for the Waltons, as their personal and corporate political spending gets funneled to both Democrats and Republicans. Instead, the family’s spending is about power. Robert Reich, Common Cause’s chairman and a former U.S. Secretary of Labor, notes that Walmart sets the “wage floor” as the largest employer in America, with 1.4 million U.S. workers. When Walmart and other companies pay such low wages that employees can’t get by or get out of poverty, the American taxpayer ends up subsidizing the corporations through public assistance to those workers. Walmart is far from alone in spending big money on politics to protect its power and its profits. Perhaps the largest spender in support of low wages is the U.S. Chamber of Commerce. The U.S. Chamber represents America’s largest corporations and spends millions each election cycle to elect candidates who support the interests of its members in lowering corporate taxes and blocking consumer protection laws. In the 2014 cycle alone, the U.S. Chamber shelled out more than $35.4 million on “independent” political expenditures, largely to support Republican candidates across the country. That’s nearly the same amount the U.S. Chamber spent in 2012, when the presidency as well as control of Congress was at stake. Meanwhile in Washington DC, the Chamber spent more than $166 million between 2013 and 2014 on lobbying the federal government against raising the minimum wage, consumer protections, and campaign finance reform. Like the U.S. Chamber, Charles and David Koch, the billionaire owners of Koch Industries, have invested millions on U.S. elections in an effort to keep wages low. Charles Koch has called for eliminating the minimum wage altogether. The brothers have a combined worth of $84 billion, making them the sixth and seventh richest people in the United States. Their political network, one of the most powerful forces in American politics, raised $400 million for the 2012 elections and planned on spending $290 million in the 2014 elections. The National Federation of Independent Business (NFIB) is another big political spender and supporter of low wages. The NFIB, heavily funded by the Koch brothers’ Freedom Partners and Republican strategist Karl Rove’s Crossroads GPS, spent more than $2.4 million on the 2014 elections. Over the years, the NFIB has lobbied against the minimum wage, paid sick leave, and collective bargaining. The National Restaurant Association, a trade association known as the “other NRA,” spent nearly $1.3 million on the 2014 elections. In addition to fighting efforts to provide workers with a living wage and paid sick leave, the restaurant group has worked to silence tip workers who want to raise the federal tip wage of $2.15 per hour. Organizations representing tipped workers, such as the Restaurant Opportunities Centers United (ROC), note that that minimum has not been adjusted since 1991. Despite the poverty wages tipped workers receive, the National Restaurant Association has turned to Rick Berman, a controversial public relations strategist known for working for corporations and conservative groups, to launch smear campaigns against their opponents over the years. The political clout of companies and corporate trade associations that employ low-wage workers is growing thanks to Citizens United and the erosion of campaign finance laws. According to a recent report from Demos, big-box retailers such as Walmart, Home Depot, and Target spent more than $30 million on elections and lobbying in the 2014 election cycle; that’s almost $6 million more than they spent in 2000 and equals the combined annual incomes of about 2,000 minimum wage workers. “This company is huge,” Sal said in questioning why Walmart can’t afford to pay its employees a living wage with respect in the workplace. 5 Years After Citizens United, We Ask: Whose Government? Whose Voice?